The first steps of the oral evaluation process are the cleaning and exam. During this first visit, we will clean, polish, and floss the teeth. Occasionally topical fluoride or desensitizer is applied when necessary. The examination consists of an oral cancer screening, a periodontal charting, a restorative charting and of course, the dental treatment planning. The cancer screening has two stages: the first is to check the visible soft tissues for growths or suspicious lesions of the tongue, palate, cheeks, throat, and gums while the second entails reviewing the panoramic x-ray to evaluate the bone, nerve, sinuses and joint for pathology. We know that recognizing and diagnosing lesions in the initial stages can be life saving. If you have any areas of concern, please make us aware so that we can rule out any need for further evaluation. The periodontal charting consists of making measurements of the gingival sulcus or pocket depth to determine the health of the periodontium. The readings are made in millimeters; the 1-3mm readings are considered normal and any reading greater than 3mm indicate areas of inflammation. Recession and mobility of the teeth, if any, are also noted during this time. With all this is completed, we can make an accurate diagnosis of the gingival condition. The following are the most common diagnoses: Health, Gingivitis, Chronic Periodontitis, and Aggressive Periodontitis. Health is defined as firm, pink gums that do not bleed or show any signs of inflammation. Gingivitis is literally “the inflammation of the gums.” Bleeding is the characteristic finding when scaling and probing the teeth. The redeeming quality of gum tissue is that it is resilient. This means that gingivitis is completely reversible with the proper professional cleaning and good home care, including brushing twice per day and flossing before bedtime. 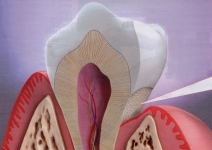 Chronic Periodontitis is characterized not only by inflammation but also by bone loss and recession of the gums. It is diagnosed by looking at the pocket depths, the recession present and the bitewing x-rays to evalaute the level of bone loss. It can be further classified into mild, moderate or severe cases and is exacerbated by poor oral hygiene, smoking, diabetes, bruxism, use of some long term medications, changes in hormones, certain illnesses, and stress. Some say that genetics can predispose an individual to chronic periodontitis but is not a direct cause. Aggressive periodontitis is the rapid loss of bone causing recession most likely in the first molar and incisor areas. It is typically seen in young adults that start to notice the looseness of the teeth. In some instances, teeth can be lost at a rapid rate if measures are not taken to control this situation. Bacteria are the main cause of this condition and often a periodontist along with the general dentist work together to help arrest the process. If you believe you may have aggressive periodontitis, contact your dentist immediately. Fillings are done when decay is present in a tooth. The decayed areas are cleaned out and the resulting hole or space is filled in with a white, resin composite material. These composite fillings do not contain any mercury or silver. They bonded to the tooth, eliminating the need for reduction of healthy tooth structure to get the mechanical retention that is necessary to place the old amalgam silver fillings. Resin composite restorations are not only beautifully esthetic but strong and durable also. Some of them even release fluoride over time, protecting the tooth from future decay. All fillings done in our office are done with resin composite. A veneer is a thin layer of restorative material placed over a tooth surface, either to improve the esthetics of a tooth, or to protect a damaged tooth surface. There are two main types of material used to fabricate a veneer, composite and porcelain. A composite veneer may be directly placed (built-up in the mouth), or indirectly fabricated by a dental technician in a dental laboratory, and later bonded to the tooth. In contrast, a porcelain veneer may only be indirectly fabricated at the lab and cemented to the tooth at a subsequent appointment. When choosing veneers, the teeth’s appearance can be changed with minimal tooth preparation or drilling. Many veneer procedures can be done with the use of little or no local anesthetic. Traditionally, a reduction of approximately 0.5 mm is required for a porcelain veneer causing them to be thin and to allow some light to reflect through. This gives a natural enamel appearance. 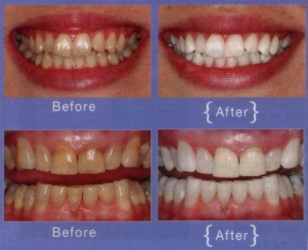 There are some veneers which do not require any preparation. Instead, these veneers are constructed to be placed on top of teeth. As a result, treatment is less invasive and may be less time-consuming. Veneers are used cosmetically to resurface teeth to make them appear straighter and possess a more esthetically pleasing alignment, color, and contour. They are especially ideal in cases where whitening will not mask the deep internal staining of the teeth. Veneers are also a quick way to improve the appearance of mal-positioned teeth without need for orthodontics or braces. We encourage you to be involved in the new smile design as we go through the process. The doctors here at Molina Dentistry will review the benefits and limitations of treatment and let you know if you are a candidate for the procedure. We know you will enjoy your new veneers and with proper home care instructions and regular office visits, they will be beautiful for years to come. A bridge is an option for correcting tooth loss and maintaining proper mouth function. A bridge, also known as a fixed partial denture, is a restoration used to replace a missing tooth by joining permanently to adjacent teeth or dental implants. A bridge is fabricated by preparing the teeth on either side of the missing tooth for crowns. The final restoration is made up of 3 connected crowns: the crown on the front tooth, the crown to replace the missing tooth, and the crown on the back tooth. If more than one tooth is missing, more crowns are added to the bridge to replace all the missing teeth. The final bridge is cemented to the teeth and therefore is not removable. Bridges are made of the same materials as crowns. They are cleaned by using a floss threader (as you would use a needle and thread) to get under the “fake” tooth and dislodge any plaque that may be present. This is of critical importance as the bridge depends on the adjacent teeth for support. Keeping those teeth as clean as possible ensures the stability and health of the bridge for years to come. The doctors or a staff member here at Molina Dentistry will be happy to demonstrate the proper way to floss your new bridge. the adjacent teeth can tip in to the space. This is the body’s natural attempt to close the space. To avoid these complications, the doctors here at Molina Dentistry will discuss all options for restoration of the edentulous space. Such methods include implants, bridges, or removable partial dentures. You may brush your teeth normally but do not brush the extraction site. A cold compress may be helpful to prevent swelling along with taking 800mg of Ibuprofen every 6 hours for adults. The Ibuprofen is an anti-inflammatory and will reduce swelling while relieving discomfort. Tylenol (1000mg) may be taken in conjunction with Ibuprofen if pain persists. Minimizing strenuous activity can decrease the chance of bleeding. You may eat whatever is tolerable, but cold soft food may be the kindest to the extraction site. Please call the office if you have questions or are experiencing heavy bleeding or severe pain after an extraction. If you elect to use the trays to brighten your smile, we will make impressions of both arches of teeth and construct custom trays that will mold only to your teeth. We will provide you with a whitening kit that is tailored to your specific needs. Either hydrogen peroxide or carbamide peroxide are the active ingredients in these gels. We will show you how to place the gel into the tray, making sure to wipe the excess gel off the gums as this can burn and cause uncomfortable sensations. The trays are then worn for 2 hours during the day or at night while sleeping, depending on the gel that was chosen. Noticeable changes can be seen as soon as two weeks after beginning the process and no damage to the teeth or existing dental work is done. When you have reached your desired shade, only yearly touch-up are necessary to maintain your new bright smile! Many pharmacies and drug stores sell OTC whitening products. These products lack the strength and efficacy of the professional products. The generically-shaped strips are made to fit most mouths. The issue with this generic design is that the whitening agent gets on the gum tissue and can burn or damage it. Please consult the office for more information regarding this whitening method as we can tell you the limitations and benefits of these products. Whitening is a process by which the color of the teeth are brightened by applying either hydrogen peroxide or carbamide peroxide gel that lightenes staining and discoloration until it is invisible to the eye. The best time to whiten the teeth is immediately after a cleaning because all the stain, plaque and calculus (tartar) have been removed from the teeth. The whitening agents will not penetrate through these barriers, and some bacterial colonies can actually inactivate the gel and decrease its effectiveness. Most people can benefit from whitening, but it does have limitations for a select few. We have found that the younger the patient, the more profound effect the whitening agent has over a shorter period of time. For older adults, a longer whitening regimen may be necessary to achieve the desired result. The doctors here at Molina Dentistry can make recommendations at your next oral evaluation if you are interested in whitening. Clinical studies and research have proven that whitening is completely safe under the supervision of a dentist. In fact, Dr. Molina considers this the safest cosmetic procedure that can be done as it does not alter the original tooth composition in any way. It is not recommended for children under age 13, pregnant women, or those with severe decay issues. Whitening lasts the longest in patients that begin to whiten at a younger age. It also has a more lasting effect in those who are nonsmokers and refrain from consuming drinks that stain the teeth. Whitening is “touched-up” on average about once per year for adults but can last much longer than that depending on lifestyle. The main side effect of whitening is sensitivity. Most report little to none, but some experience temporary sensitivity while using these products. This sensitivity is 100% reversible and is normally gone 1-3 days after completing the regimen. Some patients choose to take a day off of using the gel to allow the teeth to be less sensitive before resuming. Basic over-the-counter pain relievers can be used to decrease sensitivity (ie. Tylenol or Ibuprofen). We encourage you to contact us with questions or concerns about whitening.